Dr. Weeks’ Comment: Once they target the cancer STEM cells, which are the really dangerous cancer cell, they will help people. By targeting the cancer TUMOR cells, they make people suffer and fare worse. A Stony Brook-led team of researchers has identified a gene that could offer new hope for treating triple-negative breast cancer, the most aggressive subtype of the disease. Led by Lori Chan, PhD, Assistant Professor in the Department of Pharmacological Sciences in the Renaissance School of Medicine at Stony Brook University, the researchers have identified a specific gene involved in the cancer stem cell (CSC) population process of triple-negative breast cancer. By blocking this gene’s action, tumor response to chemotherapy is improved. Their findings, published in Cell Death & Disease, illustrate a potential new way to treat incurable triple-negative breast cancer. 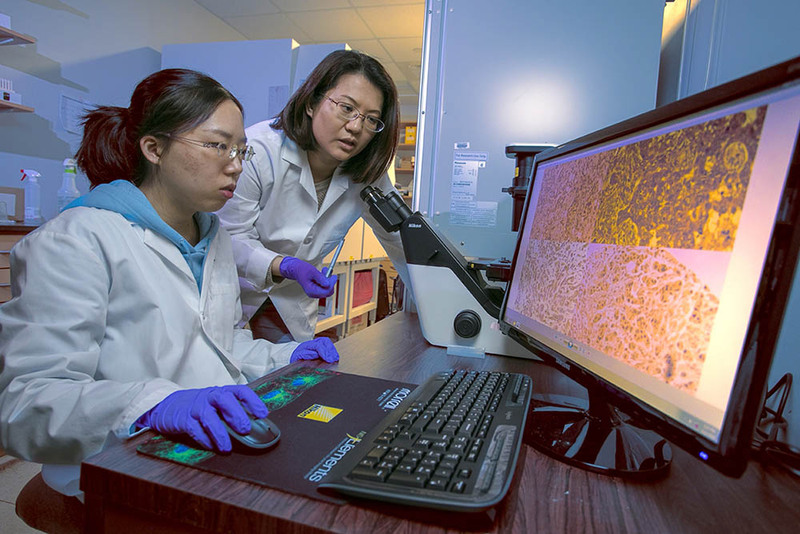 Lori Chan, PhD, and her doctoral student, Jiabei He (seated), analyze slides that how triple-negative breast cancer tissue is affected when the action of the USP2 gene is blocked. The challenge posed by triple-negative breast cancer is that the tissue making up this form of the disease harbors enriched CSC populations in tumors. Current chemotherapies to treat triple-negative breast cancer kill the cancer but spare much of the CSC populations, which trigger recurrence. Therefore, by blocking this gene chemotherapy resistance is reduced, or eliminated, which potentially is a curative way to treat the disease, Dr. Chan emphasized. Unlike with other forms of breast cancer, hormonal or antibody therapies against triple-negative breast cancer are not effective when there is tumor recurrence. Dr. Chan’s co-investigators include Jiabei He, a doctoral student in the Department of Pharmacological Sciences, other scientists from Pharmacological Sciences and the Stony Brook University Cancer Center, and researchers in the Department of Pathology and Cell Biology at Columbia University Medical Center. The research is supported in part by grants from the National Institutes of Health (ROI CA211912), the New York State Department of Health (C31845GG), and the Susan G. Komen Breast Cancer Foundation and Carol M. Baldwin Breast Cancer Research Fund.